Our fun weekend started out with an Easter egg hunt on Saturday morning. Growing up, every year we would go to our very close friend's house, the Berger's, and have an Easter egg hunt with their children. Even though we're all grown up now, they continue to have it each year for their grandchildren. I've known this family my whole life, we're practically related, so of course we get invited each year. The festivities start out with dyeing eggs, and then the children go to the front yard and play games, while the adults hide the candy filled eggs and some of the dyed ones too. Along with the candy filled eggs, there is always a golden egg with money in it. Last year Mattie found it, with some help from Mommy (I wasn't cheating though, because I didn't know where it was)! This year there were two golden eggs, one for the older kids and one for the littler kids. Mattie loved hunting for candy filled eggs, but didn't really care for the real eggs. She actually picked up one of the real ones and realized that it didn't have candy in it, so she put it back on the ground! This year the golden egg for the older children was hid in the deep end of the pool, idea courtesy of my sister Stephanie and my good friend Alex. Of course they got permission from their parents first, and then it was pretty funny to watch the kids jump into the cold pool for that money egg! Well, actually only Spencer and Adam jumped in, and Spencer prevailed. After the children finished hunting the eggs, we had a lunch of egg salad sandwiches, carrot sticks and potato chips. This is also a tradition! When we had just about finished eating, Kathy Berger came out to the patio to let all of the adults know that she had hid a golden egg for us in the front yard, and that it had $50 in it! We all went running and started searching like crazy. She told us that she had out done herself this year, so we knew that it was going to be difficult. After searching for what seemed like forever, Andrea found the egg, even though she's only 13 years old, and wasn't suppose to be looking. Kathy had taken leaves from a tree and taped them around the egg, and then nestled the leaf-egg back into the tree. Matt searched that tree like four times and never saw it. Andrea gave the money back to her Grandma, deciding to use it to buy a ham for Sunday dinner, to go along with the turkey we would be having. It was pretty funny, but also a little disappointing. I wanted that egg so bad, that I was digging in the ground and actually got a couple of slivers from the mulch and such! Sunday morning we woke up earlier than normal to attend a baptism held before church. We have 9 o'clock church, so the baptism was at 8 am. I took the time to curl Mattie's hair, and then Matt got her dressed into her Easter dress. I was finishing up getting ready, so I asked him if he would take a couple of pictures of Mattie, before she could do the 2 year old thing by getting messed up! Next thing I know they are coming in from outside and her curls are just about completely flat. Now we all know that FL is a humid place, but put rain on top of that... those curls never stood a chance. I honestly don't know why I even bother! Of course there was no time to fix her hair, so she went to church in her pretty dress looking all ragged. Oh well. It was a very nice sacrament meeting. I even got Matt to sing in the choir with me, since he's been home the past two Sundays! By the time church was over the weather had cleared up. We didn't have time for family pictures before church, so I made sure to fix Mattie's hair before taking pictures in the afternoon. I just want to finish this post by saying how grateful I am that I have a Savior who gave His life for me, and for all of Heavenly Father's children. I'm grateful that I have Easter time to reflect on the importance of the atonement, and the life of Jesus Christ. He gave His life for us all, but more importantly, He lives. This weekend truly was a special one for our family. For those of you who don't know, the LDS church owns a large cattle ranch here in FL. The chunk of land is huge and contains not only cattle, but many citrus groves as well. This piece of land happens to be in our stake boundaries, and every year when I was growing up they would have a rodeo as a fund raiser. As I got older they stopped having them. Well a couple of years ago, they decided to start them up again. We always have a lot of fun eating barbecue and watching the rodeo events. 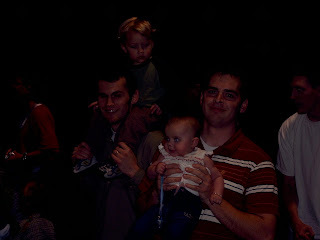 Two years ago Mark, Tallie and Luke came to the rodeo with us. This year some friends of ours, Jody and Dieter Weiss, were in town visiting my sister Stephanie and her husband Greg. They all came over to enjoy the evening with us. 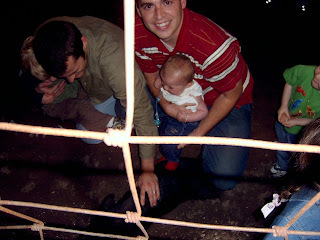 Matt's favorite part of the night is when they let the children go down to the arena and chase baby pigs! Last time Matthew did this with Mattie she was only 6 months old. Needless to say, it was a little different this time for her. Matt seems to understand the way those little piggies think, because both times he has done this, he goes to the same spot on the outskirts of the arena, and sure enough all of those pigs run right over to where he is standing! He puts one hand down, grabs hold of that little pig, and then proceeds to put our daughter on top it! It was crazy, but everyone watching thought it was hilarious. Last summer when we were in Utah visiting Matt's mom (MoMo's Ama), she arranged for the kids to go horseback riding. Mattie took to that horse like a little pro, and ever since when she sees a horse she wants to ride it. Seriously, I had talked to her about chasing a pig so that she would be excited, and when we got there and she saw those horses, it was like the pigs didn't matter. All she wanted to do was get on a horse. We found a very sweet girl who was more than happy to accommodate Mattie's wish. All in all, it was a great night with family and friends. Matt has been flying a lot lately, which means us not seeing him very much. This past week after being gone on a four day trip, then home one day and then leaving again on another four day trip, Mattie and I decided since he couldn't come home to us, we would have to go to him! He had an extended lay-over in Charlotte, NC. We flew up on Wednesday night and spent all day Thursday hanging out with him. We were going to rent a car, but the prices were a little outrageous because of the basketball tournament going on. Instead we just did the taxi/bus thing and went to the mall. We walked around the mall for awhile and then got lunch. It was getting close to Mattie's nap time and she was acting very tired, so we decided to walk down the block to go check out a movie. It was beautiful outside and along the way we saw some wonderful trees with white blossoms on them. It looked like "popcorn popping" on those trees, and since that is Miss Mattie's favorite song, of course we had to sing it as we walked down the street! The movie was a little lame and Mattie actually stayed awake to watch the whole thing. After a few more adventures we finally ended back at the hotel for the night. The next morning we accompanied Matt to the airport, us heading home to FL, him heading off to Cincinnati. Even though his day was filled with the typical delays, he made it home just in time for the Deseret Ranch Rodeo (stay tuned for that post, possibly tomorrow).